Looking for a 12 week Christmas savings plan? You can have a debt free Christmas with this printable Christmas challenge! Imagine a Christmas where the bills didn’t follow you into January…February… or March. I know what usually happens; it used to happen to us, too. You get caught up in the joy and giving that’s synonymous with the Christmas season, and before you know it, you’re in debt up to your eyeballs and your feelings of joy are replaced with feelings of discouragement. Panic sets in and you realize you spent. too. much. How will you pay for it all? My friend, there are 12 weeks left before Christmas, and I want to challenge you to have a debt-free Christmas this year, and each year moving forward. You can do this! Research estimates most Americans will spend an average of $781 on Christmas gifts this year, and those figures don’t include other Christmas-related items, like Christmas trees, cards, postage, gift wrap, decor, or traveling to be with family. Since $781 is the estimate, I’ve put together a Christmas savings plan for you to save $800 in the next 12 weeks (October through December). This plan works well for anyone who’s paid weekly OR bi-weekly; if you’re bi-weekly, be sure you plan for the larger sum to be saved on a payday, and the lesser sum on the in-between weeks. THEN… when this year is over, Christmas is past, and you have NO DEBT… begin saving on January 1st for next year’s Christmas. This is what our family does! We’re huge fans of Dave Ramsey and saving to pay cash for everything. For example, saving $50 out of every bi-weekly paycheck gives you a whopping $1300 for Christmas next year. YOU’VE GOT THIS! 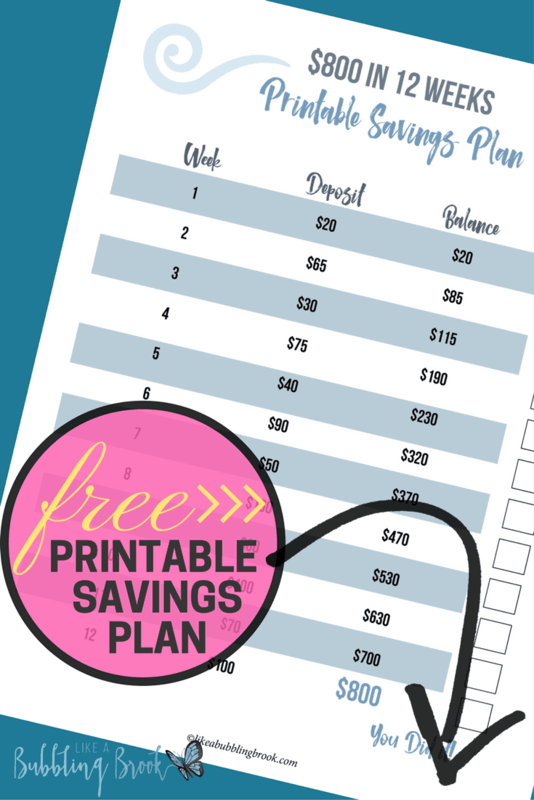 Click here to download your free Printable Debt-Free Christmas Savings Plan PDF, and then… be sure to read our story of how we paid off our house. What other savings plans have you done? What works best for you when it comes to saving money for Christmas? Let me know in the comments! Cook at home instead of eating out. We used to waste so much money going out to eat! Try a program like emeals (the link takes to you a free 14-day trial) to help you create simple, inexpensive meals at home. You’ll save MORE money on your groceries each month than the small amount you pay for their service. Find ways to earn side money from home, such as working as a virtual assistant to bloggers or by starting your own blog. That’s what I did, and now I get to work from home while I help others! It’s a win-win! Mvelopes: This is the online budgeting program we personally use and LOVE. It works great with Dave’s baby steps. In fact, we purchased a lifetime membership several years ago when they offered it to us. It’s like a virtual cash envelope system, and it syncs with your bank accounts. Here’s my full Mvelopes review, or you can click here for a free 30 day trial of Mvelopes. SoFi Loans: I’ve not personally used them since we’re debt free, but I’ve heard so many good things about them! If getting a loan is unavoidable for you, or you need to refinance student loans, be sure to check them out. You can apply on SoFi’s website (<–this link will also get you $100 cash bonus when your loan is funded) by setting up a simple account and then entering information about your education, employment, and income. Read our SoFi loans review here.